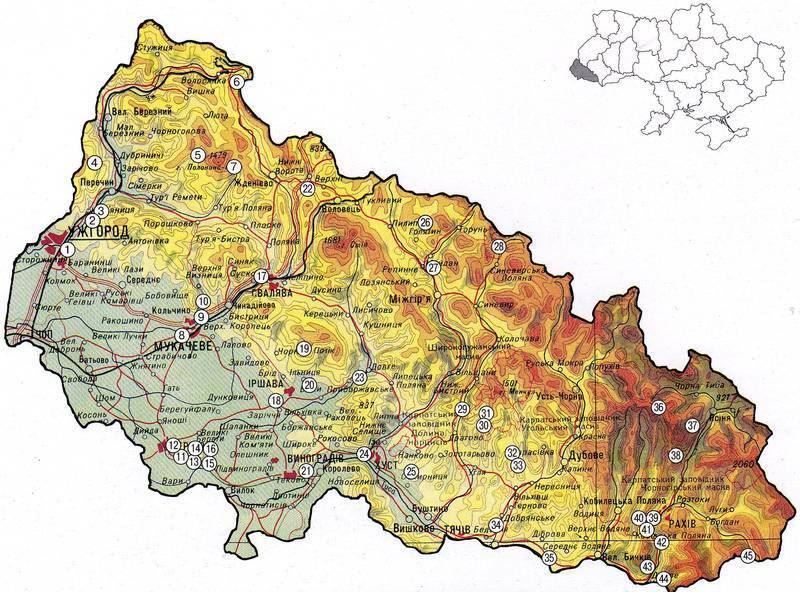 Regional Information Center "CARPATHIANS" » GEOLOGICAL LANDMARKS OF UKRAINE. TRANS-CARPATHIAN REGION. The territory of Trans-Carpathian region is situated within south-western slope of Carpathian Folded System and Trans-Carpathian Depression. In geotectonic respect the north-eastern mountain part of the Region belongs to External (Folded, Flysch) Carpathians. It comprises a range of litho-tectonic zones (thrusts) which change one another from north-east to south-west as follows: Skybova, Krosnenska, Chornogorska, Duklyanska, Porkuletska, Magurska, and Rakhivska. The External Carpathians are composed of typical flysch units of Early Cretaceous — Late Paleogene (sometimes up to Early Neogene) age. The mountains are overgrown with beech and fir forests above which at the top portions there are flattened Alpine meadows (“polonyny”). Quite impressive decorations of Carpathian landscapes are the glacial forms (circus, kars, moraines with lake depressions) as well as — Carpathian pearl — Synevyr Lake and some lesser ones. On the south-west the External Carpathians are contiguous with the zone of Trans-Carpathian deep-seated fault which includes external and internal Marmaroshska and Peninska sub-zones where in stratigraphic section dominate non-flysch carbonate and terrigenous sediments of Triassic to Late Paleogene age. Within these sedimentary sequences there are known Mesozoic intrusive and extrusive rocks. In the relief above zone is placed as the intermediate unit between Carpathian Mountains and lowland of Trans-Carpathian Depression. There are characteristic landscapes formed by parti-colored chimera cliffs on the background of emerald-green century-old forests inside which sometimes (basins of Velyka and Mala Ugolka Rivers) one can found impressive nature sites of karst caves. Peninska zone (“suture”, “root”) differs by extensive tectonic breaking that is fairly clear seen in numerous outcrops and is very essential for studies of Carpathian tectonics and geodynamics. South-western part of the Region belongs to the Internal Carpathians which Early Alpine complexes are mainly buried underneath Late Alpine molassa of the superimposed Trans-Carpathian internal depression (Trans-Carpathian lowland). In area of Uzhgorod city a small ledge of the latter depression is observed on the surface being presented by Paleogene deformed flysch rocks (Pidgallya zone). On the south-east of the Region there are exposed extensively folded and broken Pre-Mesozoic (from Vendian to Permian) metamorphic rocks of the Marmaroshskiy crystalline massif which are in places overlain by Triassic, Jurassic, Cretaceous, Eocene, and Oligocene carbonate with minor terrigenous and extrusive rocks. Neogene Trans-Carpathian Internal Depression comprises three tectonic units. First of all this is very interesting in geological respect, forest-overgrown volcanic unit (Late Sarmatian-Pannonian) which is called Vygorlat-Gutynske Volcanic Ridge. Its meridian section which is confined to Oashskiy cross fault separates the Depression into Mukachivska and Solotvynska depressions. Trans-Carpathian Depression was formed because of Neogene tectono-magmatic activation of the Internal Carpathians and is characterized by wide distribution of negative (cauldrons) and positive (uplifts) circle volcano-tectonic structures resulted from volcanic centres of that time. Trans-Carpathian Region is extremely rich in mineral resources. There are known and studied deposits of mineral, thermal and fresh waters, various non-metal and construction materials, and also studied five ore areas: Ugolskiy (mercury), Butovo-Olenevo-Dubrynychska strip (mercury), Vyshkivskiy (mercury, gold, base metals), Rakhivskiy (gold, base metals), and Beregivskiy (gold, silver, barite, base metals, germanium). In the latter area there are preserved and accessible for observation the ancient mines for ore minerals. « FAUNA OF VERTEBRATES OF THE WESTERN UKRAINE. SUMMARY.